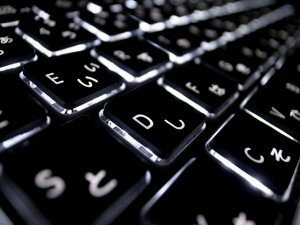 Typing has become such a critical part of our lives. 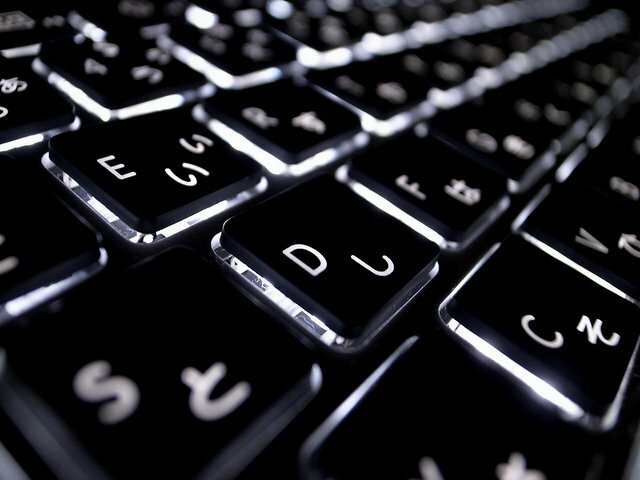 Can you even imagine how much typing you do on a daily basis? Between Facebook, Twitter and email, your little fingers are probably quite busy typing away on the average day. So it only makes sense that if you are practicing a language, you should be able to type in that language as well, right? These days you have it pretty easy. Before the dawn of Windows, people who wanted to type in Japanese had to type with a kana keyboard. As a matter of fact Japanese keyboards still have kana printed on them, but only older people use them anymore. Nowadays, you have this handy thing called the IME that does some crazy voodoo magic to allow you to type pretty easily in Japanese. This is actually a little freebie that has been thrown into Windows. It is quite simple to set up and use actually. 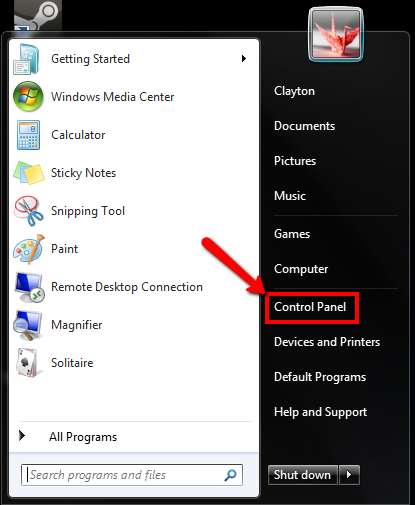 Click on the start button (that glossy windows thing in the lower left corner of your screen) and open up the control panel. Then, you should see something like the following Text Services and Input Languages menu. The big difference will be that yours will probably not have the Japanese keyboard already installed. My PC has it installed already because I have a physical Japanese keyboard (that actually has built in shortcut keys for the Microsoft IME) and so when I installed Windows on this machine it just automatically installed the Japanese keyboard along with the Microsoft IME as the default keyboard. Yes, even if you have a physical Japanese keyboard you will still want to setup the Microsoft IME. In case you were wondering it is a Microsoft Natural Ergonomic Keyboard 4000, and I highly recommend it if you are going to be doing a lot of typing. Anyway, for this menu click the Add… button. By the way, this is also where you can set the default input language. If you become really comfortable using the Japanese Microsoft IME keyboard, you can set it here as your default so that you don’t have to keep switching to it after you boot up your PC. You can use the IME to type in both Japanese or English as we will see in a bit, so this is a good option to remember. After you press the Add… button, you should see this Add Input Language menu. Scroll down and find the Japanese (Japan) options, open it up by clicking the + sign and select Microsoft IME. The Japanese keyboard only allows you to type in a kana, which as I said before is what older people in Japan use. So, to avoid confusion, don’t install it. It’ll just clutter up your language bar. After you’ve done that click OK. 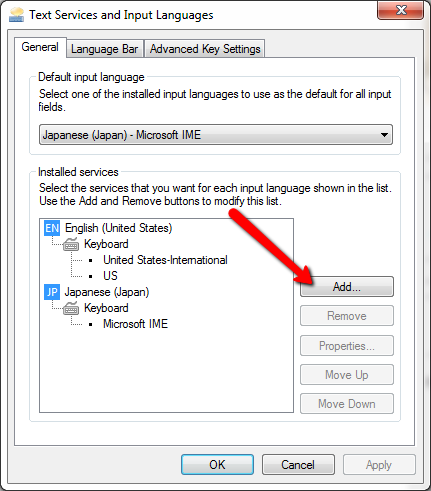 This will take you back to the Text Services and Input Languages menu, where you can confirm that you’ve installed the Japanese (Japan) – Microsoft IME keyboard. After doing that, go ahead and click the OK button. Then click the OK button on the Region and Language menu. And Windows might prompt you for your installation disc, or simply just ask you to log out and back in again depending on your setup. You should see this down in the lower right of your screen hanging out with all your tray icons. 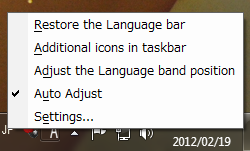 You can also un-dock it as well by right-clicking the JP or EN icon and selecting Restore the Language bar. The main advantage of this is that you can switch conversion modes (you can set the IME to bias for names or speech) easily or use the IME Pad (to draw kanji that you don’t know the pronunciation of) Clicking the kana button will enable you to use those awesome kana keys. Basically, there are 3 systems of romanization for Japanese: nihon-shiki, kunrei-shiki, and the hepburn system. In brief, nihon-shiki is a direct transliteration of the Japanese writing system, it converts ち for example into ti because it comes from the t- line of kana – た ta, て te, ち ti, と to, つ tu (actually pronounced tsu as in tsunami). However, we don’t pronounce ち as the English ti, we pronounce it chi, so that is why the kunrei-shiki system was developed. However, the hepburn system is more widely used for official things. This is generalizing a bit, but the big difference between hepburn and kunrei is that it uses more punctuation to indicate stops, long vowels and such. It is a little trickier to type in so I would recommend sticking with kunrei. Although, you can use the nihon-shiki system to type with the IME if that is what you are comfortable with. When it is in this mode, you can type in English like a regular keyboard. Some of the punctuation buttons will be in different places. Most noticeably the single quote -> ‘, will be above the 7 key and not off to the right like it is on the English keyboard. 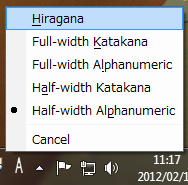 If you switch to hiragana mode, by clicking on the ‘A’ and selecting hiragana, you can type in Japanese. You’ll see romaji on the screen until you make a kana. For example, if you type hjkly, it’ll show up as romaji. You must type a valid kana and then it will automatically switch to the kana. So if you type the letters konnichiha, you’ll get こんにちは. Now if you hit enter, it will simply leave the kana as is. If you want to use the kanji, you have to hit the space bar. This will give you the IME’s best guess as to what kanji you want to use. If you hit the space bar again, you will see a pop up menu where you can select the kanji that you want to use. These shortcuts allow you to rapidly switch between typing in English and in Japanese, which is handy if you are say practicing vocabulary on memrise or filling out a form for a Japanese website. I should also note that the Microsoft IME will remember what you are using in what window. So, for example, if you are typing in Japanese in Wordpad, you should be able to switch to Firefox and type in English without changing it in the IME. Did I miss something? Did you have problems setting up the IME? Let me know in the comments below and I’ll try to clarify. P.S. Do you like hearing about cool stuff? Me, too! Sign up for the newsletter! P.P.S. Do you like to party? Then try joining my Facebook Page for all the latest updates. I didn’t even know there were other IMEs out there. Doh! That looks pretty cool. I’ll have to check it out. I use Google IME too. I liked the MS IME, but having the word prediction in Google IME is really handy when learning to conjugate verbs. Some great links, I’ll have to read up on the Google IME. Great introduction to the IME on Windows 7. I think, unless one has a real Japanese keyboard, this is a topic everybody will worry about at some point. Personally, I find the standard IME on Windows the one that suits me the best and it is one of the key reasons I keep using the OS as whole. OSX’s Kotoeri and Google’s IME didn’t really cut it for me in some way or another, though I it has been years and is probably about time to give am a shot again. One of the main reasons is that I find the IME Pad very helpful. One can write Kanji and Kana with a mouse (or pen on a tablet pc :-), and thus write look up Kanji without knowing their read-ings. I used to be a heavy user of that feature when I started learning Japanese. The other IME don’t offer this (Or do they by now? I remember some Apple video with Chinese Input via Trackpad). I would also like to mention that it is possible to change the keyboard shortcuts of the Windows IME to more suitable one. This especially important to people who change the IME’s key-board layout to their native one and lose the ability to quickly switch between “English” and Japanese input by the shortcuts you introduced. I tried to put together a little intro myself about this myself at https://nejtj.blogspot.com/2011/09/howto-japanese-ime-with-non-japanese.html. I have installed the language as per the instructions given by you. However, it gets converted to a Japanese keyboard and I am not able to type in English and then change it to Japanese. Please help me. Can you select the alphanumeric input on the IME? So that it shows an A and not あ? Did you put it in the ‘A’ mode or the ‘あ(hiragana a)’ mode? The hiragana a (あ) will get you kana, the ‘A’ mode will get you English. So you just want to type hiragana? Like this: これは ほんです。? You can just hit enter after every piece of the sentence you type, then hit the space bar. Hi, have been using MS IME for months, no problems. 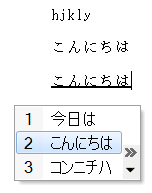 I type in romaji, which displayed as hiragana, and then I’m given a choice of kanji if appropriate. I’ve been poking around looking for help, tried reinstalling the language bar, rebooting my computer, everything I can think of, and I can’t clear this problem. haha, thanks for the PS comment first off. Anyway, it seems like what happened is you switched it into ‘kana keyboard’ mode. I use Google IME at the moment, but I think there is a button on the Microsoft IME that just says KANA. If you click that it should revert back. Or maybe, you might have to select it as keyboard from the keyboard menu. Does that make sense? It’s common issue, I used to do it all the time. Let me know if you fixed it! Just wanted to thank you – I had the exact same problem as Alice above, and had no idea how to fix it until I ran across your site. Thanks! I was wondering if you ever tried to type in outlook with japanese ime? It gives me some box with a green arrow to insert directly into the body after i type. It only happens in html formatted emails and not RTF. Know of any way to get rid of this box and type straight into the body like Word? I haven’t. That sounds like an issue with the Office IME, which I’ve heard is somehow different than the regular Microsoft Windows IME. I stopped using office a long time ago (at home), so I don’t have a lot of experience with it. My guess is that you can try to switch back to the standard one somehow? Hi Ryan, did you ever solve this problem? If so, do you remember how. I’ve been trawling the internet all day and can’t find a single reasonable solution (it seems like most people offer the advice to “remove all languages that aren’t English”… hardly helpful in this situation. If you go to the language settings in outlook you’ll be able to add editing languages. 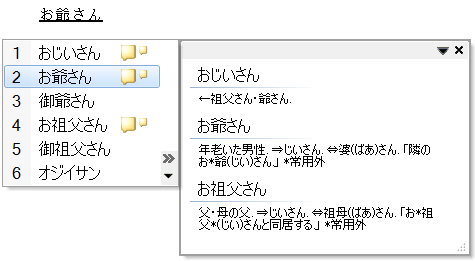 For Outlook 2010 the path will be File > Options > Language, and under “choose editing languages” you can add japanese. 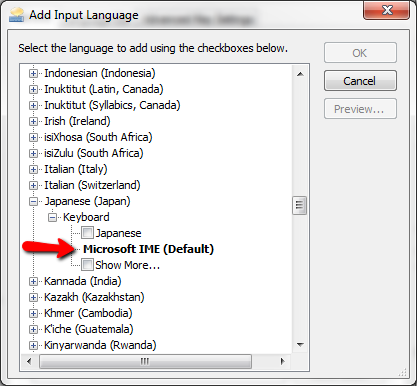 Microsoft IME [Japanese Language]-” The property settings for Microsoft IME is not available. Original title: Microsoft IME [Japanese Language]. That sounds like a privileges problem. For example, you installed the IME as the administrator, but you are trying to run it as a regular user. Do you know how Windows 7 registry is modified by the IME setting? In HKEY_CURRENT_USER\Keyboard Layout\Preload, the Japanese Keyboard seems to be code “00000411”… Any idea what the IME keyboard would be? My son is studying Japanese at school and installed Japanese fonts and keyboard mapping. We can switch back and forth now. However, even when we return to English some system is coming up Japanese. For instance when I change the volume the text is in Japanese. The slash between directories is no longer a slash but a Japanese Yen sign. How do I go back? I’m using Windows 7 Ultimate 64bit, but should be something similar for any recent Windows. Change that back to English and you should be fine. You’ll probably have to reboot. This works very well when I’m using Word or other microsoft programmes. But I have it set to Japanese now, and this is what I’m getting. I don’t seem to be able to type Japanese into Firefox. I think you might be using the Office IME. The Microsoft IME should work in all programs. I’ve never had issues with it not working in non-Microsoft programs. But, I heard office has its own IME. I personally stopped using Office a really long time ago, so I don’t know for sure. I have followed the Steps to set the IME for Japanese Language. Everything is working fine, however the only issue I am facing is that it does not remember the last word I have used. For example, when you type anything in Japanese it shows some suggestions(press space bar) to you and when you type the same work again, It should automatically change to the work you have last chosen, Which in my case is not working. Any Suggestions please. I don’t think the Microsoft IME does remember the last word you used. You have to use the Google IME for that I think. I’ve just installed the Google IME on my Mac and saw some differences from yours. While you have Hiragana, full- and half-width Katakana, full- and half-width Alphanumeric, I have full-width and normal Alphanumeric, half-width and normal Katakana and Hiragana. Will this be a problem when I’m practicing vocabulary on memrise or am I getting worried for nothing? I don’t think it really matters. I almost always use just the hiragana setting. Sometimes, you have to use full-width alphanumeric for poorly programmed web forms though (like if you have to register for online banking in Japan or something like that). I have the windows IME set up on two machines, using it to test a customer software. On one machine I get characters as soon as I type – on the other machine only after pressing enter (the field remains empty and the cursor does not move while typing until enter is pressed, and then I get the full word at once). For the life of me I cannot find which setting controls the difference between the two behaviors. Any ideas? That sounds like what happens in a Java app, like Gimp or OpenOffice. Sometimes, you won’t see the Japanese word until you hit enter (or you can see it but it is in the bottom corner of the app or somewhere else on the screen.). Are you using different apps by any chance? I began studying Japanese on Memrise with your courses. I completed ‘Introduction to Japanese” without major problems, but now in “Learn Basic Japanese” I’m in trouble when I have to digit Japanese: the fact is that I just don’t seem to find a way to digit the final Japanese ‘n’ in words like ‘ARIMASEN’ or ‘…JIN’. If I hit Enter, the answer is accepted by Memrise (and is generally wrong, since the final N is actually a Latin N). However if I hit the spacebar nothing happens, except a space, but the N stays the same. Or, which is even worse, a part of the word I typed before in Hiragana or Katakana changes into kanji, so I get another wrong answer or I run out of time. What is it with this N??? This is going to make you face palm but you just have to type n twice nn -> ん. Thanks for using the courses! Thank you so much, I just found this problem while I was actually making notes from memrise for a friend since they have a slight interest. I was originally just copying and pasting each character, found IME tonight and then found the ん problem and now found your comment so you have literally saved me from ever having to copy and paste anything again! I have a big problem writing Japanese with Paint! I asked my boyfriend to type something for me, he pressed some keys and since then it doesnt work the same as before! I could write horizontally before… but since that happened all letters appear written on the side (like rotated but it has nothing to do with the rotation button, because i tried that too). I must send you a photo to understand what i mean… I dont know how i can solve this! Could you help please?! so when i type “ti” IME writes “chi”. Then what do i need to type to get an actual “ti”? What do you mean by ti? I mean what kana? This is a great guide and it helped me a lot, thank you! However, when rightclicking on JP in the taskbar and using the language toolbar set to JP, both appear in Japanese, as well as the settings menu (as accessed from the language toolbar). I have my Locale set to Japan(which I need for certain programs to display text), display language set to English, and I’m using An Asus X52Fs laptop running Win7 Home Premium. It’s not desperately essential, I just tend to panic when I see vast amounts of kanji. I just upgraded to Win 8.1, which has a slightly smoother setup, so I can’t really troubleshoot too much for you. Where did you buy the laptop? US? My guess is that it is getting its language preference from the locale, which it really shouldn’t, but you know, Windows. Also, did you happen to install it, while Windows had the display text set to Japanese? That might have set the preferences permanently to Japanese. Is there a way to fix this? I assume it’s automatically pressing enter for each character. I’m not sure, but it sounds like you may have the kana setting on. When you hit say ‘f’ on the keyboard do you get は? If you do, then it is set to kana. You may also have it set to hiragana and not direct input. I have a problem When I hit say ‘f’ on the keyboard I get は? I do not know the reason Could you tell me ? I went through all the steps to add Japanese IME, but after doing all this, there is NO language bar on my computer!! Nothing. So….. I do not have it, still? When I go to try and add it again, it says it’s already added. I simply have no way to find JP or EN or find any language bar….why is it not showing up?? I am Japanese but I am using US computer or keyboard..etc.. I added Japanese then, when I type English with Japanese Microsoft IME. Most symbols changed placement. and I can’t find @ mark.. I have another computer but everything is fine. Only this computer. You probably have drivers for a Japanese keyboard installed for your US keyboard. Also Windows 8.1 has serious problems with Japanese keyboards. 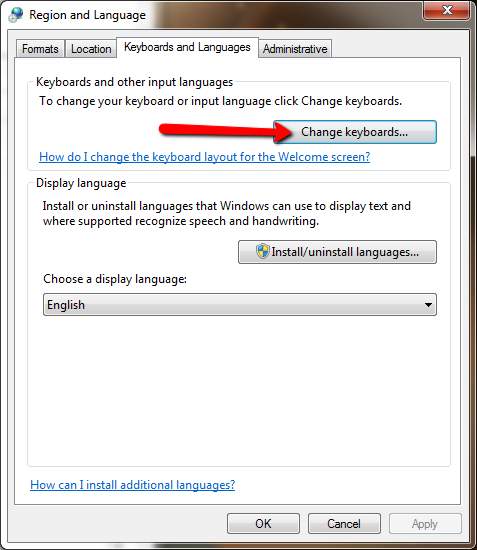 For example, Windows 8.1 has trouble recognizing and installing drivers properly for my *Microsoft* Japanese keyboard. How can I change the font of Japanese using IME? I have Windows 10, and Japanese IME is installed. I don’t like the font that it displays, but I cannot find a way to be able to select the different fonts. I recall that there was Mincho and Gothic which I cannot find, and I’ve seen nicer Japanese fonts on other people’s messages. Can you give me some tips? Just to add, I’m talking about when I am writing in an email, like Yahoo. I can see I can change the Japanese fonts in Word, but my email doesn’t give me any font options, so is there a way I can change the default font for the Japanese letters? Thanks! Are you writing emails in a browser? You might want to look at the default fonts for that particular browser. I’ve opted out of Win10 (I tend to hold back by one version so that Microsoft can work out all the kinks), so I don’t have any real world experience unfortunately. I purchased a Japanese and English keyboard, I just cant set it up with windows 10. please let me know the steps to make it work with windows 10. You have somehow set the keyboard to ‘kana’. There should be a little ‘kana’ button in the language bar (that little thing in the lower right That has either あ or A in it.) Clicking on that button should switch the keyboard into romaji mode, which is what you want. It has been many moons since I used the IME’s for japanese….I was truly stumped on this little boggle, many thanks for setting me right. I’m having trouble typing on my mac sometimes it wont type in kana unless I type really quickly????????? Help and I don’t have the option to choose kanji?????????? I have a problem which I have never encountered and need a help desperately. When I type, “Watakushiha” and expect the appropriate Japanese to be typed. But what comes out is entirely different Japanese as if it has lost its function. I don’t know how to fix it since it never has happened on my Japanese setting. Please help me. Sorry for the late reply, but it seems like you somehow turned on the kana keyboard. Look around in the settings for a ‘kana’ button.